1978 or ’79 | age 10 or 11 Han and Chewie check out of the operation room (?) 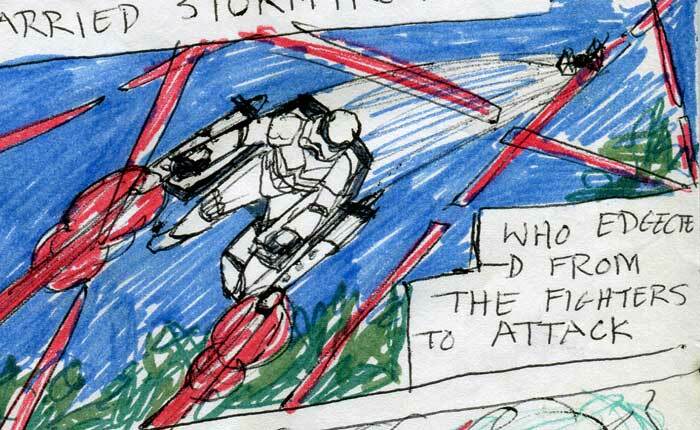 after the R-Bomb detonates, and prepare to meet a new Imperial threat from the skies: Jetpack Stormtroopers! Above: Checking out. Chewie with his arm in a sling. What the..? A lá ‘The Force Awakens!’ This was 1978 or ’79! Similar to The Force Awakens, Chewie’s right-arm is injured. There’s no bandage here, just a sling. But still… And do you like the smashed lockers on the right. We can see how Han and Chewie hurriedly got their clothes and gear together in a hurry—without actually seeing it. 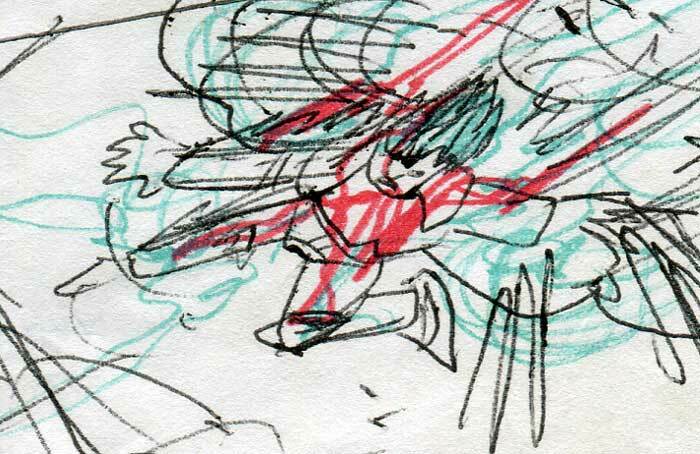 That’s visual-storytelling shorthand. Above: Luke Skywalker—still in his Throne Room ski jacket. That’s pretty cool! I like that Luke’s still in his ski Jacket, from the medal ceremony. Once again, it seems like this is happening within minutes of the first film. In The Last Jedi movie, that short time-lapse between it and The Force Awakens feels a bit problematic for me. The Last Jedi opening crawl text, informs us that the First Order now ‘reigns supreme.’ This, even though… a few hours (minutes?) earlier, their massive Starkiller base had just been destroyed by the Resistance! I have an excuse though: I was a just a little kid when I did my sequel. Cor… Stromtrooper TIE Fighter Pilots! Above: A Stormtrooper flying a TIE Fighter! This comic has nearly everything a kid could want! Double-Cor… Flippin’ Jet Pack Stormtroopers! 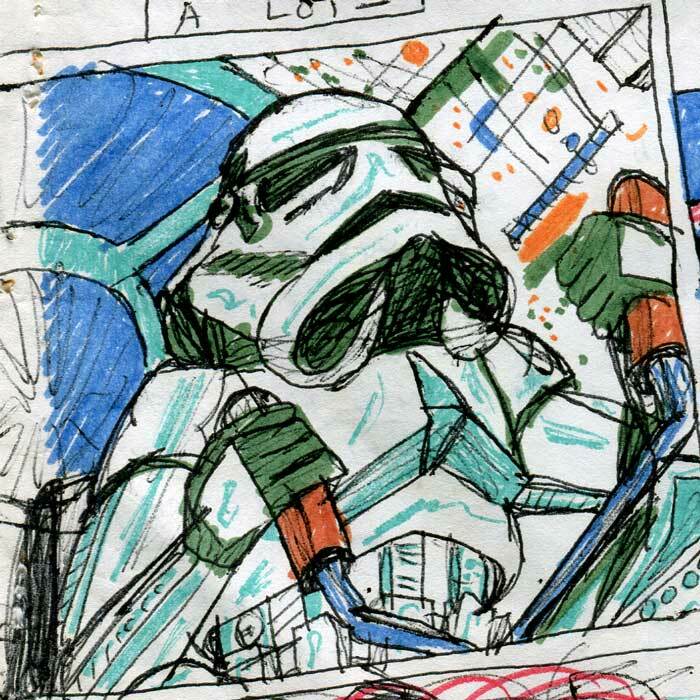 Above: An ‘edgected’ Stormtrooper flying in a jetpack chair—with flippin’ twin laser cannon? This comic has EVERYTHING a kid could ever want! Oh my God. Flippin’ bloomin’ heckin’ bleedin’ Jet Pack stormtroopers! Crikey chums, it’s ace! And it’s out now in all good toy shops. From… Palitoy! 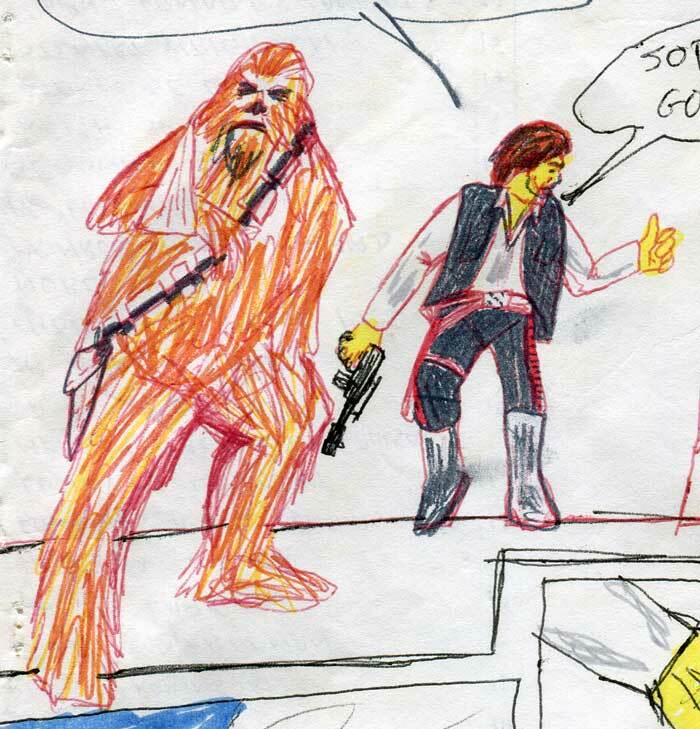 Even if George Lucas didn’t want me to draw Star Wars comics for Marvel, surely he and Charles Lippincott should have hired me to work in merchandising? Of course they should. (They already knew of my work—clearly). 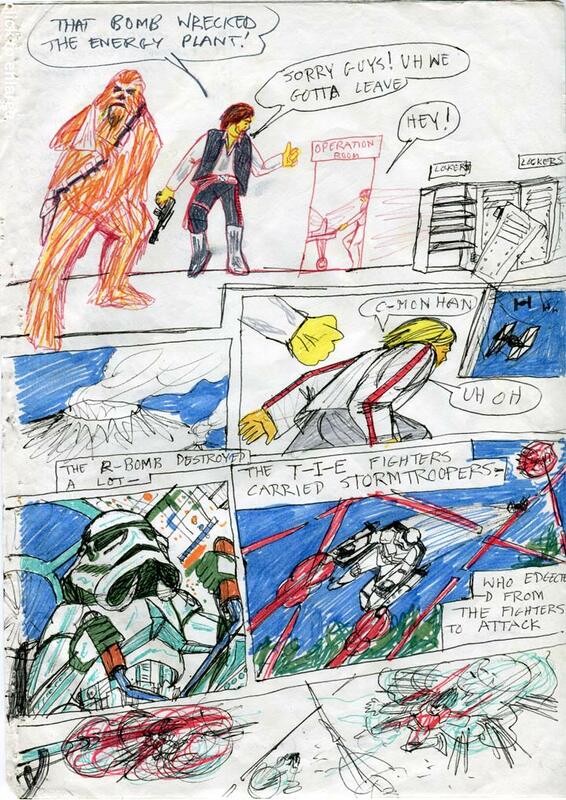 As I said before, George had traveled back in time, via a wormhole (or some sciencey thing) to my bedroom, read my ‘Star Wars’ comic adaptation and then went even farther back and made a film out of it. It’s the only explanation. So knowing as he did of my brilliance, why didn’t he hire me? 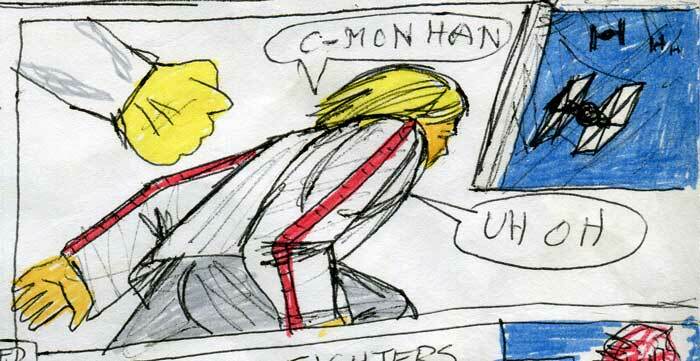 Was he nervous about having copied my comic? Was he hoping that I wouldn’t notice his new film coming out—which was uncannily like my comic—because I was living in an isolated village in Ireland? Apparently it’s a good attack strategy to fly down in a TIE Fighter, then eject from it in a Jetapackchair, and get blown to pieces in your underpants. I wonder if those expensive, unpiloted TIE Fighters just went out of control and crashed? It’d make sense for them to have had autopilot. I’d say it was within their technical capability. 10 year old me probably didn’t give it much thought though. Because: flippin’ brill’ bloomin’ Jetpackchair troopers!